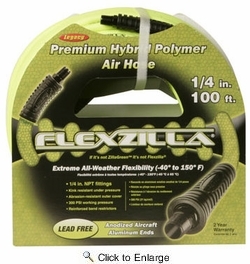 Flexzilla Air Hose Assemblies - Flexzilla air hoses offer superior flexibility for tight radius bends in both cold and warm environments. Its premium hybrid polymer material permits use in environments where general purpose PVC and rubber hoses may become too stiff. No memory, lays flat, Kink resistant under pressure Extreme all-weather flexibility, even in subzero temperatures! (-40� to 140� F). Maximum working pressure: 300 PSI. 3:1 Safety factor. Excellent abrasion-resistant outer cover. Anodized aircraft aluminum fittings, lead free. Includes bend restrictors that reduces wear and tear, prolonging the life of the hose. 1/4" Inside Hose Diameter. 0.46" Outside Hose Diameter. 100 foot Hose Length. 1/4 Male NPT anodized aircraft aluminum fittings.